20 years ago a tradition was started – The Laguna Beach Plein Air Painting Invitational. Each year the best of the best plein air artists are invited to come to Laguna Beach to paint and to celebrate the legacy of the early plein air artists who established Laguna Beach as an Artists’ Colony, founded the first Laguna Beach Art Association and opened the first Art Gallery in 1918. The Laguna Plein Air Painters Association (LPAPA) is considered the steward of Laguna’s artistic heritage, and our mission is dedicated to preserving the plein air legacy and painting tradition for future generations. We celebrate our 20th anniversary of the Laguna Beach Plein Air Painting Invitational with the publication of our first hardbound book. 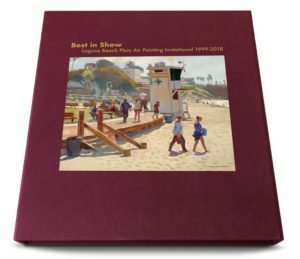 This special 20th anniversary book, authored by Mr. Jean Stern, the leading authority on plein air art and Director of The Irvine Museum Collection at UCI Institute and Museum for California Art, is a recording of the Invitational history and showcases the top award-winning artists who have helped LPAPA further its mission to celebrate and preserve the plein air painting tradition. Click here to Buy Book to Ship to Address Outside the U.S.